Close folder: The folder is displayed folded. The favorite transactions are not visible under the folder. 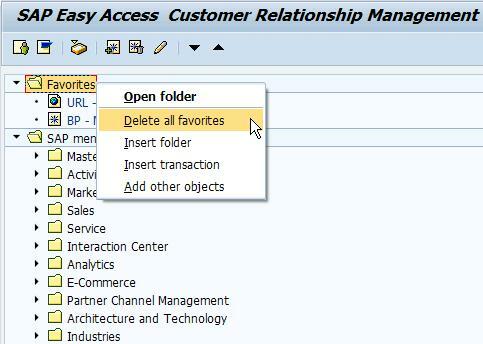 You can right click again and choose ‘Open folder’ to open the folder again. Please note you can manually delete each favorite by right clicking on it and selecting the ‘Delete favorite’ option. How to copy a single user favorite to 20 other users ? I know how to do for a single user. one way is that we can download the favorite and we can upload the favorite to other user. How to leave the folder open without it being automatically close?